Ugh, I kinda want a pair. Dammit. 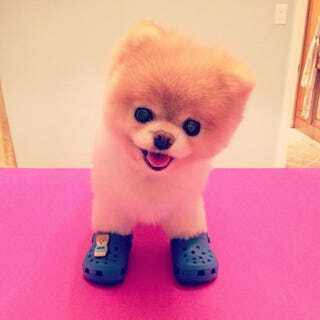 That's right, the ridiculously adorable Pomeranian (?) has launched a shoe collaboration with Crocs — making "Jibbitz" charms that you stick through the holes of your Crocs to make them even more obnoxious/adorable, depending on whether or not you have eyes. "Boo's whole 'I'm a dog, life is good' outlook is built around being cute and comfy," said the licensing company's co-president Tamra Knepfer, "so this Crocs deal is perfect." The Boo Jibbitz currently come in two iterations: a close-up of Boo's Head and a Boo wearing a Boo T-shirt full-length version. Don't just sit there, go get your Boo-ble* heads!! *Like bobble heads? Kinda? No?